Supporting both DMX512 output and DMX512 input individually configurable on each channel along with Art-Net and sACN protocols the ultraDMX2 PRO is the perfect choice for small to medium rigs. DMX merge functionality works from both Art-Net/sACN, DMX Input and USB DMX sources providing plenty of configuration possibilities. Designed and manufactured in New Zealand to the highest standards. Static IP or DHCP network addressing. Ships with DHCP enabled. Fully compatible with software suitable for ENTTEC USB DMX Pro. Drivers for Windows, OS X, Linux. ultraDMX2 PRO - 2x DMX512 Out or DMX512 In with Art-Net, sACN E1.31 and E1.20 RDM support. DMX512 Out or DMX512 In functionality selectable on each port. Merge 2 incoming Art-Net/sACN streams per output channel with both HTP and LTP options. Merge Art-Net/sACN + DMX input -> DMX output. 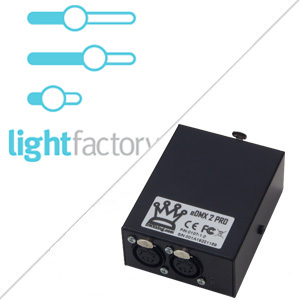 Merge DMX input + USB DMX source -> DMX output. USB DMX enhanced mode for 2 Universe Out or 1 In 1 Out. 1500V Isolation between every port. Art-Net broadcast, Art-Net II, III & 4 unicast, sACN/E1.31 Multicast and sACN Unicast support. Available with 3 pin or 5 pin XLR sockets. Accessory port for external show triggering and future add on devices. Fully compatible with *ALL* software and hardware that supports Art-Net, Art-Net II, III & 4, and sACN protocols. Standalone show playback without computer or network connection.